Was the belt colored yellow out of the box or did you do that to read the number? > you do that to read the number? It has a small square yellow mark painted on the belt to the right of the part number(the small yellow square is factory) ...... I used yellow tire crayon to make part # etc number more visable in photo. Thanks for posting all the photos Mel! It's a real treat to see the history unfold. Here's some pictures of the early deep dish hubcaps compared to the later shallow hubcaps. I think the problem with the early deep dish caps was they were prone to getting clobbered by curbs etc . Wow was this car packed in boxes when you got it, because most every pic is something NOS~! A few items where in the trunk..... but most of the NOS items pictured are from my 1960 Corvair NOS parts collection. Hub caps, early to late? wtf? Dude, the two different caps are 60 and 61. 1960 uses the deeper style, and 61 uses the shallower style. These are not both 60 caps..
1961 Corvair 700 Coupe, 140 H.P Head, 147Cu-In w/4-speed, currently collecting parts and "in-progress"
> not both 60 caps..
still looking good with all the extra info! 1966 Corsa clone 140 4 speed, 30 over. DON'T mess with Old Men, we didn't get old by being, STUPID!!! More international hubcap history ......Some if not all of the Canadian 1960 hubcaps were made of brass and then chrome plated, unlike the USA hubcaps that were made from polished stainless steel.In one of the pictures you can see a trace of the brass color on the backside of the Canadian hubcap. The chrome plated brass caps are quite a bit more shiney compared to the stainless steel versions. 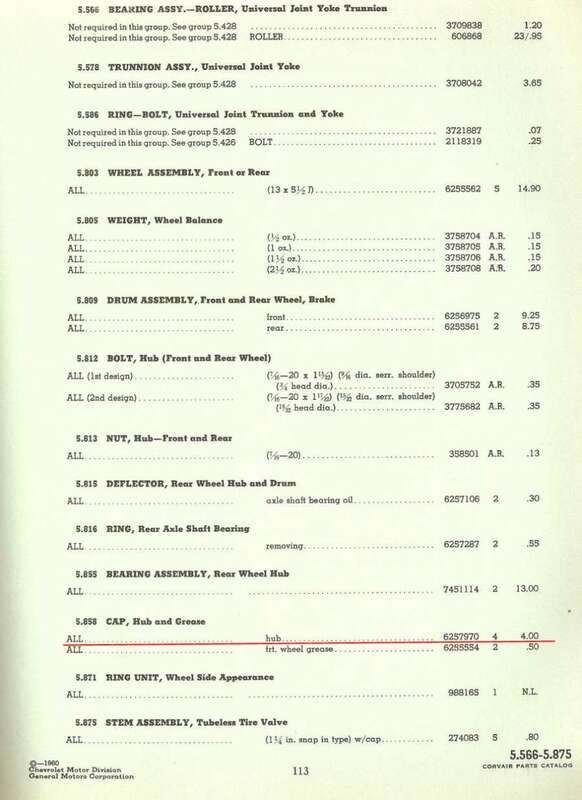 GR: 1.060 PN: 3779945 is a conversion/upgrade kit as listed in the April 1st 1960 P & A 34 catalog. 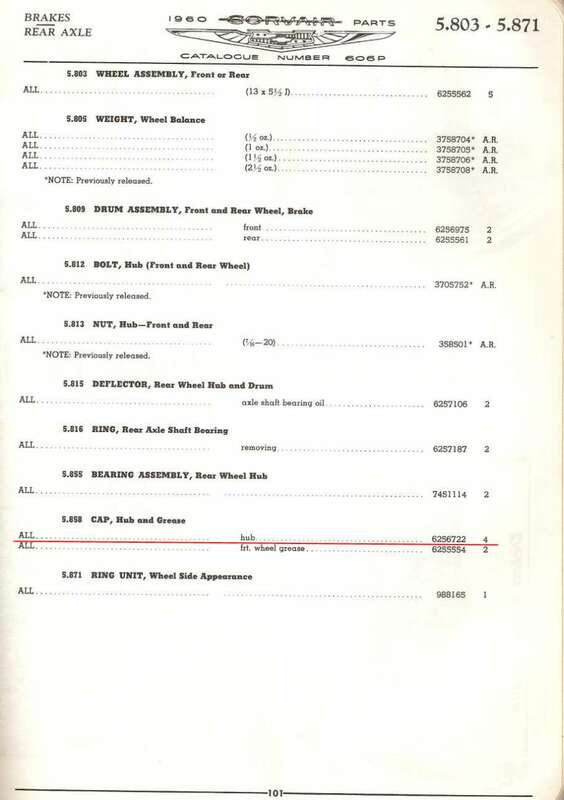 Canadian catalog has no equivalent, just separate part numbers. It's interesting that you figured out the difference between hub caps. Part number on box that contains hub caps is Canadian, but U.S. catalog displays a completely different number. 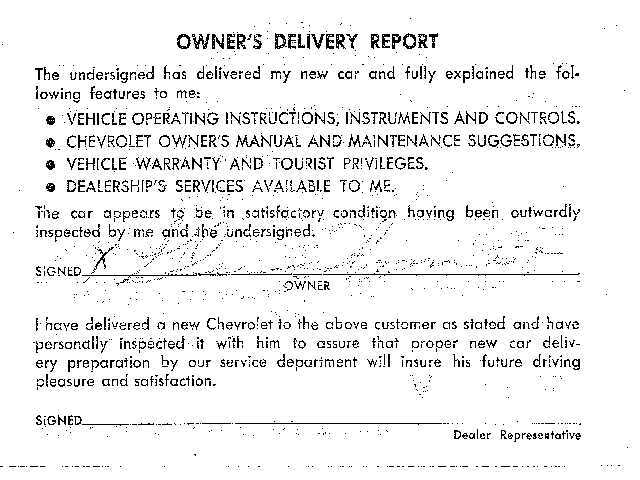 Attached is a Dealer file warranty copy for a 1960 4 door, I believe. 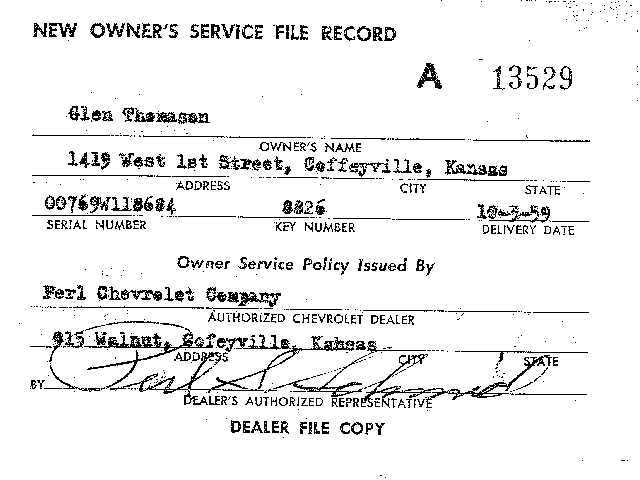 The serial # is not very low, but the the 10-3-59 delivery date must be one of the first delivered in Kansas. Any got this car? This stuff is so interesting! I'm glad you got this car because all of these little early/Canadian details wouldn't be noticed by 99% of us. It's a great education for all. Bravo! Now with all the talk about Canadian car differences I'll have to go to my storage area and check out my Canadian 60. It's body number 236 built 2nd week of January 1960.